We have been examining this huge question, what is Ikebana? We have been trying to find how the word, Ikebana came about historically. 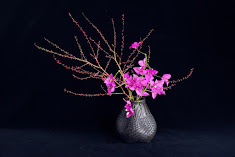 I assumed that ikebana (a style of Ikebana) was created in contrast to Tatehana and Rikka, the mainstream styles of Ikebana. In answer to my question about the origin of ikebana Dr Osamu Inoue (Vice president of International Society of Ikebana Studies, Kyoto University of Art and Design) sent me his paper, “ Chabana and Nageirebana in the early modern times: Their differences and similarities.” It is a brilliant work and suggests that my assumption about ikebana was right to some extent. However, the origin of ikebana is too complicated to talk about in this essay. There are so many definitions of ikebana in Japanese history. One thing we do know is that in the early modern era ikebana was in opposition to Tatehana, the style of flower arrangements mainly for ceremonies. In Tatehana, the main stem tends to stand upright at the centre of the arrangement. Some people felt that the style was too rigid and too artificial. It was a wish to create something more naturalistic that motivated the development of ikebana. At the base of the long history of Japanese Ikebana philosophy is the opposition between Tatehana and ikebana, between artificial and naturalistic, and man and nature. These opposing ideas led to a deepening of the philosophy of Ikebana. The result was a unique Japanese art form with a rich aesthetic. Ikebana means to make flowers alive, which can be achieved through respecting how they are in nature. If you manipulate flowers too much, you are not making them alive. I’ll discuss this point further sometime soon. This is the work I made for Hanabishi restaurant in Melbourne. They always prepare interesting materials for me and I was given yuzu this time. I hope you will enjoy my Ikebana works as well as the beautiful dishes at Hanabishi. This is the third year we run Ikebana Gallery Award for the Ikebana students all around the world. It seems to be popular with the number of page views over 50,000. We will publish the result in August. Please visit our new website.